Exotic Animal Medicine Review & Test is the ideal way for students and clinicians in general practice to study, explore and extend their knowledge of this exciting new field. 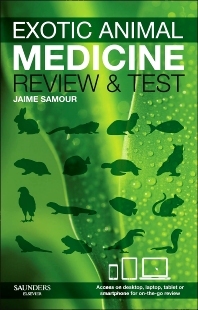 Distinguished avian specialist Jaime Samour and his international team of contributors from 13 countries present the reader with a collection of over 60 selected clinical cases observed in mammals, birds, reptiles, amphibians and fish species kept commonly as pets. Additional cases are included of some species maintained in zoological collections, captive breeding centres or brought into rescue and rehabilitation centres around the world. The cases are presented in a systematic format using descriptive and diagnostic images and clinical and laboratory data, challenging the reader to formulate a differential diagnosis, to suggest a recommended therapy pathway, to provide an educated prognosis and to propose ways of prevention. The definite diagnosis, treatment, preventative medicine and final comments are provided at the end of each question. A recommended list of further reading offers the reader additional consultative information on each medical condition addressed. In presenting comprehensive clinical and diagnostic information, Exotic Animal Medicine Review & Test allows the reader to explore cases in more depth and with more imagery and background data than may be available in other sources. It is perfect for the continuing education needs of busy clinicians and for veterinarians in training who wish to test their ability to establish a differential diagnosis. A selection of cases from the book, plus a range of more advanced bonus cases, is presented in interactive format on a companion website, which is optimized for viewing on mobile devices. Mammals. Birds. Reptiles. Amphibians. Fishes.